When it comes to selecting toys for my kids, I like to try to find things that will spark their creativity. Creativity, in my opinion, is one of those things that you have to really exercise to have. Creativity really allows you to think outside of the box and is a definite assist when you are trying to solve problems. Creativity can come in many forms, it can be artistry, storytelling, problem solving, decorating, and more. I am excited to give my children some two new Crayola products this Christmas. The first is the Crayola ColorStudio HD app and Crayola iMarker digital drawing tool from Griffin. This app turns your iPad into a coloring book. I like the idea that they have a "marker" to color with and can't wait to check it out. The other is Crayola Story Studio. With Crayola Story Studio, you can scan a photo of your child and turn them into a comic book character. You can also use your computers camera or simply create your own comic book character (think Mii). Your new comic book character will join the pages of the story alongside Spiderman, Princesses or Lightning McQueen. Once your story is done, you can save it, share it and print it. The printed pages can be colored and bound to be a book. Having watched my children as they spend time on the SuperWhy site, creating their own silly stories, I am expecting that they will both get a kick out of creating their own story, especially since they can star in it. "Imagine your child morphing into a coloring book character and starring in a story with a Disney Princess or Spider-Man with Crayola Story Studio or turning an iPad into an interactive coloring book with the Crayola ColorStudio HD app and Crayola iMarker digital drawing tool. When kids unwrap one of these high-tech Crayola gifts this holiday, they’ll have fun, new ways to express all that inspires them! For the child who craves action and adventure, Crayola Story Studio: Spider-Man lets kids upload a photo and transform themselves into a superhero that stars with Spider-Man in personalized comic book they create and color. 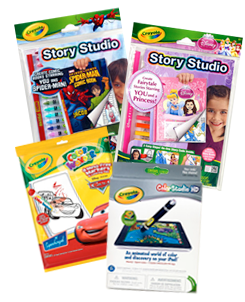 A free access code inside the kit unlocks the Story Studio application at Crayola.com/storystudio. Kids can choose a super power, story-line, and one of six villains to battle alongside Spider-Man in their own web-slinging adventure. When they finish their story, they can save it, share it or print and color it. The kit includes paper, glossy cover sheets for printing comic book-style covers, binding strips and 15 Twistables® colored pencils to create three complete books. For the child who loves fairytales and wonderment, Story Studio: Disney Princesses lets kids star in a fairytale with a Disney Princess. Crayola Story Studio™: Disney Princess lets kids create fairytales starring them and a Disney Princess! Kids upload a photo to transform themselves into a character, then create a story with their character and a Disney Princess! Story Studio includes everything kids need to create personalized storybooks and unlimited coloring pages – just print, color and bind the pages. They can choose storylines from Cinderella, Beauty and the Beast, the Little Mermaid, Tangled, Sleeping Beauty, and Princess and the Frog. With the free on-line access code that comes inside, Pip-Squeaks® markers and glitter glue, blank sheets and binding strips, kids create three complete story books! 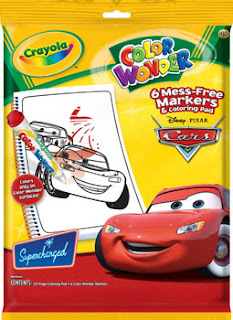 For the child who likes creative adventures, the Story Studio Adventure Maker: Cars 2 lets kids join the pages of a story with Lightning McQueen, Mator and the Cars 2 characters form Disney Pixar. The set includes 10 Pip-Squeak Skinnies markers, 3 Pip Squeak broad line markers, 2 Pip-Squeak glitter glue tubes, 30 story sheets, 6 glossy cover sheets and 3 comic binding strips to make three complete story books. At $9.99 for each kit, Crayola Story Studio proves that high-tech doesn’t have to mean high cost! Remember how cool it was to receive the Crayola 64 Box with the built-in sharper as a holiday gift when you were growing up? 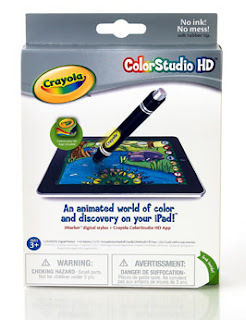 Just imagine how excited your kids will be to turn an iPad into an interactive coloring book using burnt sienna, carnation pink and a rainbow of Crayola colors from the Crayola digital 64 Box! The Crayola ColorStudio HD app and iMarker let kids’ imaginations run wild as they color moving, animated scenes that come alive with music, sound effects and hidden surprises. The app is free on iTunes App Store with the purchase of the iMarker for $29.99 at Toys R Us, Best Buy, the Apple Store and www.griffintechnology.com. Kids can select from 64 colors in the digital Crayola 64 Box and then use the iMarker to create the look of Crayola crayons, markers, paints and colored pencils as the stylus interacts with an iPad. The digital coloring pages respond with movement and sound as the pages come alive as kids color. Animated images stop moving on the screen so kids can easily color them in without going outside of the lines, so objects look picture perfect when they start moving again. Tidy up your page with an eraser function or an “undo” arrow that removes larger areas of color. In addition, kids can save their work in a gallery to be emailed, printed or uploaded to Facebook (mom’s account, and with her permission and help of course! ), and also free draw, play interactive games and create their own customized coloring pages they can print and color off-line. Recommended for children ages 3+, the Crayola iMarker includes, a set of AA batteries, and free download of the ColorStudio HD app." You can find more holiday gift ideas from Crayola. You can connect with Crayola on Facebook and Twitter. You can also find Griffin Technology on Facebook. Thanks to Crayola and MyBlogSpark, one lucky A Busy Mom of Two reader will win a Crayola High-Tech Holiday prize pack. Giveaway will remain open through December 8. Giveaway is open to residents of the US only. One winner will be selected through Rafflecopter. The winner will be contacted by e-mail (be sure to leave one!) and will have 48 hours to respond or a new winner will be selected. No compensation was received for this post. I received a Crayola High-Tech Holiday Prize Pack for my family and information about the products from Crayola through MyBlogSpark. All opinions are mine or that of my family. We have lots of little cousins to shop for this Christmas--I think we would split this prizepack between at least 2 of them! I have 2 kids and they would both love this! I have two boys so this would be for both of them. My daughter and cousins would love it! My two sons would receive this if I won. This would make my 3 year old boy very happy! I would Love this for my two children! thanks! I would split this up between my 8 year old son and my 4 year old daughter...Theyd love it! My three boys would LOVE this! I would give it all to my son!! He would love it all! A great Hanukah present! I would spread this out under the tree from SANTA for both of my kids - who LOVE anything to do with coloring/crafting/etc - Awesome give away! I would give the pack to my little 5 year old...she's all about being an artist. I would give this to my 2 nieces. this would be for my five kiddos! THis will be for both my son and my niece.